Welcome to the official web-site of the Faculty of Journalism of the Belarusian State University! Professional training at the Faculty of Journalism of the Belarusian State University started in 1944. Since that time the Faculty has become one of the most prestigious departments of the BSU. More than 6000 students have received diplomas of the Faculty of Journalism. Graduates of the Faculty work in the periodical press, on TV and radio-stations, at press-centers and press-services, advertising agencies, public relation services and other fields of mass media. Over 400 students from China, Vietnam, Afghanistan, Lebanon, Syria, Senegal, Ghana, Zimbabwe, Ethiopia, Poland and other countries have graduated from the Department of Foreign Journalism. - English and Speech Communication. Training for journalism at the BSU started on November 1, 1944. 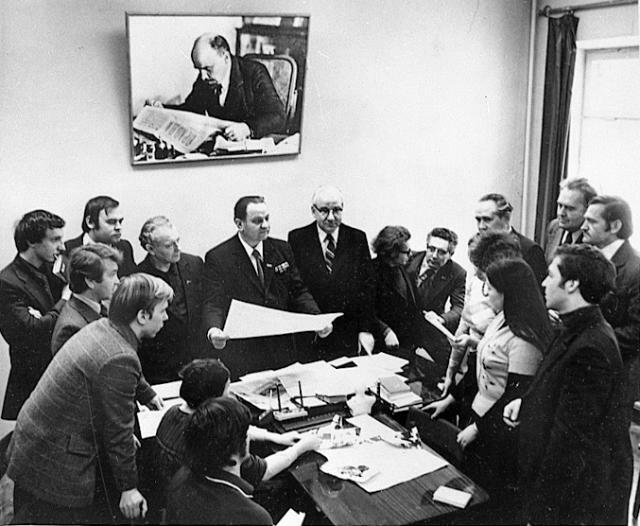 TSitting of the faculty council in 1972he first Faculty of Journalism in the Soviet Union was established in Minsk (the same name faculties at Kiev and Moscow universities were established later – in 1946 and 1947 accordingly). In November 1944 30 first-year and 11 second-year students began to attend classes at the Faculty of Journalism. In 1949 the first Journalism specialists graduated from the Belarusian State University. Three graduates of the year 1949 have devoted their lives to the Faculty: Professor Efrosinya Leonidovna Bondareva, Professor Mikhail Evgenjevich Tikotsky, Associate Professor Nina Aleksandrovna Snitsereva. Job prospects after graduation: newspapers, magazines, news agencies, Internet-editions. Training for Journalism is conducted in accordance with the curricula approved by the Ministry of Education of the Republic of Belarus. In December 2009 the Faculty of Journalism celebrated its 65th anniversary. The Faculty of Journalism is the only school of journalism that provides classical education for would-be journalists. The Educational Center of Communication Technologies works at the Faculty. It has two computer classes, the laboratories of audio-visual technologies, computer science and multimedia, press photographing and editing. Students are provided with textbooks and workbooks. The Faculty's library contains over 13,5 thousand of books, mainly books in journalism. The library regularly receives about 53 various newspapers and 56 magazines. Subjects offered by the Faculty are assigned according to the curriculum of every specialization and are divided into five blocks: social humanities, natural sciences, professional and special subjects (professional courses, electives), additional courses. Major disciplines (basic courses) at the Faculty are: Basics of Journalism, Basics of Creative Work of a Journalist, Professional Ethics, Economics and Management of Mass Media, Newspaper Design, Journalistic Skills, Legal Regulations in Mass Media, Literary Editing, Political Science, Sociology and Psychology of Journalism, etc. Besides, students study modern Russian, Belarusian and foreign languages, statistics. History of Belarusian, Russian and foreign journalism is also among core subjects at the Faculty. The list of social humanities courses is rather wide as well: Web-journalism, Press-Services in the System of Information, Business Journalism, Art of Advertising, Methods of Interview, Photo-reporting, Theatre Criticism, Information Society and Mass Media, Modern Foreign Mass Media. According to the curriculum II-IV year students are provided with a possibility to gain their internship in regional, metropolitan and national newspapers and TV-channels, press centres, press services, information and advertising agencies, publishing houses. The staff of the Institute of Journalism conducts research in various directions. The main research direction is the analysis of national mass media that is conducted for the purpose of improving the work of Belarusian mass media. Research results are implemented in the studying process. The number of publications by the staff of the Institute annually makes over 200 textbooks, scientific articles, theses of scientific conferences, etc. - Journalism as a part of literary-and-art criticism. New scientific schools appear on the basis of such scientific directions as "Political journalism", "Foreign Journalism", "Modern creative technologies of journalism and communication". The staff of the Institute is actively involved in international cooperation with higher educational institutions. Teachers of the Institute take part in competitions for international grants, publish their works in foreign editions. Lecturers of the Institute actively participate in international conferences, seminars, scientific meetings. The Institute of Journalism is a partner of numerous international organizations such as Fojo Media Institute (FOJO, Sweden), Society of Belarusian-German meetings (Free Berlin University, Germany), European media initiatives (Koln, Germany). The staff and students of the Institute regularly visit Germany and Sweden to participate in seminars and scientific projects. The Institute of Journalism of the BSU is one of the leading scientific and educational centers in the sphere of mass media on the territory of former Soviet countries. It has high scientific and pedagogical potential and conducts training of highly qualified mass media professionals ready to work in Belarus and abroad.